So, you have just learned of the pregnancy loss of a friend, a relative, a co-worker or an acquaintance. You want to offer an appropriate response, but you're not sure what that might be. In this blog we'll look at the considerations you'll want to keep in mind as you offer a comforting response. A number of readers of my most recent blog have written to me, asking how to respond when learning of a pregnancy loss. You have acknowledged the awkwardness of not knowing what is the "right thing" to say, as well as the lack of familiarity with what the term pregnancy loss might encompass. And you are aware that, all too often, the world just turns its head when learning of a pregnancy loss. There may have been no bulging abdomen, no sonogram being passed around, maybe not even a public announcement of the pregnancy. Or there may have been all of these things plus more. What is missing in both circumstances is any ritual whereby comfort can be extended to the grieving couple. There are no Hallmark cards, no funerals, no gravestones, no memories to be shared among the mourners. Only a void. And it is into this void that you may decide to venture, with the hope that you are able to offer some support and comfort. So let's consider a few things that will influence your thoughts about how to reach out to the couple. Keep in mind that a pregnancy loss may mean something different to each of them; also keep in mind that both are sad, so please do not fall into the trap of asking one partner how the no-longer-pregnant partner is doing. It is true that the woman has lost the pregnancy, but both of them have lost the dream of becoming birth parents to this baby, and both of them deserve a genuine expression of your sorrow. Although pregnancy loss can mean a miscarriage or a stillbirth, it also can come about as a result of the agonizing decision of the parents to terminate the pregnancy, either because of learning the results of prenatal genetic testing or because a multi-fetal pregnancy reduction has been advised by the couple's physician who fears for the outcome of the pregnancy if the woman attempts to carry all fetuses to term. Some couples are comfortable sharing this decision with others, but many anticipate they will be harshly judged for their decision to terminate the pregnancy and they decide to present the pregnancy loss as a miscarriage. Regardless of how open the couple may be about the circumstances surrounding their loss, you will want to empathize with their sadness and to ask how you can help. For some couples, the pregnancy loss is a dimension of their infertility. They may have had difficulty conceiving; they may have had earlier pregnancy losses; this may be a loss from an ectopic pregnancy (where the embryo begins to develop outside the uterus, often in a fallopian tube); or they may be told after an IVF procedure that, although they had a chemical pregnancy, the hormone levels did not rise sufficiently to sustain hope that the fetus would develop. For any couple grappling with infertility, a pregnancy loss is a terrifying reminder that they cannot take birth-parenthood for granted. Another, less discussed, form of loss occurs when a couple has made a plan to adopt, and the birth mother either loses the pregnancy or decides to keep the infant after its birth. The prospective adoptive couple has invested so many hopes in this adoption, that the loss will be a devastating end to what may have been years of infertility. So, with infertility as a backdrop, any form of pregnancy loss feels especially devastating. Some people assume that the attachment to a pregnancy grows in proportion to the number of months the pregnancy was sustained. It is more accurate to let the couple tell you what this loss means to each of them, because that will enable you to understand more fully the emotions they had attached to this pregnancy, regardless of how far along it had progressed. And hearing from the couple will prevent you from saying hurtful remarks like "It's probably for the best," or "You can always try again." Instead it will feel more supportive to say "This is such a difficult time for you. Please tell me how I can be helpful/ let me know when you feel like a visit/ tell me if I can bring over some food (books, flowers) or run some errands for you." And then prepare to be a good listener. Being a good listener is a gift, since it involves being emotionally present, accepting both anger and tears, and hearing various versions of events time and time again as the grieving person tries to make sense of this loss and what the future might hold. Although it may be tempting to offer what I call "false reassurances" ("I'm sure you'll be a parent some day," "You will begin to feel better soon,"), be aware that this response is more a reflection of your discomfort with the current sadness than it is an accurate prediction of hope for your friend. Try to be patient with the time your friend needs to absorb this sadness and to make sense of it. Some couples decide that they want to have a quiet service to honor this baby who will never be born. Whether conducted by a spiritual leader or created by the couple and their loved ones, such a service can enable supportive friends to reassure the couple and their family of ongoing emotional support and compassion for their loss. Some grieving couples appreciate the opportunity to talk about how they can memorialize this child whom they had hoped to parent. Keep in mind that many would-be parents have already discussed (and perhaps chosen) names, selected (or envisioned) nursery colors and decor, and begun to save items for the baby scrap book like congratulations cards and sonogram photos. For them this is not a pregnancy loss so much as the death of their dream child. In my book When You're Not Expecting, I mention couples who plant a memorial garden, donate to a children's library or a day care center, or identify a cause that they commit to in memory of their dream child. Even months after a pregnancy loss, there can be a number of painful reminders that cause the pain to resurface. The previously-anticipated due date is one symbolic time. Celebrations of others' pregnancies and births can be emotionally difficult. Even the sight of a nursing mother or a father cuddling a newborn can evoke waves a sadness. These and other reminders of lost opportunities may be mentioned by someone who has lost a dream child, and your empathic response will be very much appreciated. There are many ways in which pregnancy loss can occur. Communicate your wish to be a good listener so that you can understand the particular meaning this loss has for each member of the couple. Remember that the partner of the pregnant woman deserves to be recognized as someone who is entitled to grief, rather than being seen solely as the stoic comforter and protector. If infertility is a backdrop to this pregnancy loss, you will want to appreciate the couple's feelings of failure and desperation as they fear they may never become birth parents. Be patient, and let the couple know that you understand it takes time to grieve such a poignant loss and to make sense of how their lives have changed. Be aware of the mixed emotions couples may feel when being invited to celebrate news of pregnancies, births, or other events associated with successful reproduction. The grief following a pregnancy loss is unique. Couples often feel uncomfortable sharing information about this loss and acquaintances, many of whom may not even have known of the pregnancy, are unfamiliar with how to respond. Why is this? Typically pregnancy loss can be relatively invisible unless you choose to share this information. There are no rituals to help you mourn this loss. There are no Hallmark cards. Your physician probably relates to this loss in terms of your physical recovery. So what do you do with the feelings that assail you and your partner once you realize that you no longer are "almost parents?" Each person will experience a pregnancy loss differently, which means that you will need to be clear with relatives and friends about what they can do to be helpful. If you need privacy, say so. If you need people to run errands for you, let them know. If you need emotional shoulders to lean on, patient visitors, good listeners, then choose your loved ones carefully, because people differ in the extent to which they can tolerate your sadness without feeling obliged to cheer you up. You also need to be prepared for the unexpected: the person who last saw you wearing maternity clothes who expresses surprise that you now have a waistline; the acquaintance who has heard about your loss and seeks to comfort you by suggesting that perhaps this is "for the best," or "you can always try again;" the person who expresses surprise that, weeks later, you are still feeling sad instead of getting back to "normal," whatever that is. And it isn't just people -- how about the advertisements for everything from diaper services to baby gear that continue to crowd your mailbox, your phone calls and your e-mail? It seems as if your pregnancy is on automatic pilot for the retail world. There is another dimension that also is important to have in the forefront of your awareness. Typically even one's most sensitive relatives and friends will see the person who lost the pregnancy as the one deserving of sympathy and attention. Her partner, on the other hand, tends to be asked "How is she doing?" and "Is there anything I can do to help her?" What's wrong with this picture? Do people not appreciate that the partner also has had life hopes and dreams derailed? Do they not recognize the emotional upset that comes with supporting a formerly pregnant loved one as well as figuring out how to handle one's own grief? Do others really feel that you are not entitled to heart-wrenching sadness unless it was your body that bore the pregnancy? So, along with sorting out your own emotions when others may be confused or insensitive, you also will want to talk openly with your partner about how each of you is handling this sad time in your lives. And be sure to talk about what you need your partner to do to offer comfort to you. It is important to respect that the two of you may have different ways of working through your sadness, but keeping the channels of communication open is a significant challenge. And it is important to be aware of sources of support that are probably present in your community: spiritual leaders, professional counselors, support groups (many of which you can learn about from the social worker of your local hospital), as well as books and chat rooms that focus on pregnancy loss. This is a time to indulge yourself in taking time to regain your emotional equilibrium, even if the rest of the world seems to be expecting you to have put this loss behind you. 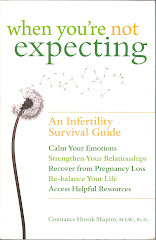 In my book, When You're Not Expecting, I emphasize the opportunity to use pregnancy loss as a time to grow emotionally, to bond more sensitively with loved ones, and to decide how to move forward with life following this poignant jolt to your hopes and dreams. So don't let anyone discount your grief -- you are entitled to it. And, with support, hopefully you will find your own ways of weaving it into a new and more resilient emotional perspective. If you never have been in therapy before, or if you are beginning a relationship with a new therapist, or if earlier counseling experiences have had nothing to do with your infertility, you probably are feeling perched on the brink of a new opportunity and a new challenge. Undoubtedly you already are receiving either a diagnostic workup or medical treatment for your infertility, and your decision to seek counseling is an important step in handling the many emotions that emerge in this process. So, now that you and your counselor are beginning your relationship, how can you get the most out of the therapeutic experience? Most therapists will initially ask you to be clear about what you hope to gain from therapy. I'm going to make the assumption that you and your partner are going to the first session together, so both of you will need to think about how you would answer this question. It is not unusual for partners to have different perspectives on the challenges posed by infertility (see my video at www.connieshapiro.com/ ), so you both should feel free to speak for yourselves. Also, if some issues are more compelling than others, or if you have tried and not succeeded to make desired changes in your lives, it is good to provide that information as well. In addition to answering questions posed by your counselor (who, for the sake of pronoun simplicity, I will assume is female), you should feel free to ask her to talk about how she sees her role as a therapist, what expectations she will have of you as clients, how she guides the counseling process with her clients, and how you and she will know whether you have accomplished as much as possible in your relationship with her. You should be listening for how open she is to your input, how she formulates goals for the counseling experience, how familiar she is with infertility, particularly issues of loss and communication difficulties, and how she evaluates whether she is being helpful in moving you toward the changes you hope to accomplish. For you and your partner, both of you should be prepared to view therapy as work: on your relationship, on your relationships with others in your lives, on your communication skills, on your willingness to strive for insight, and on your openness to considering new options in making decisions about your future. As I have mentioned in an earlier blog, I tend to give homework assignments, and if your therapist follows this practice, it is helpful to be conscientious about the therapeutic learning that takes place both outside and inside the therapist's office. You might think of it as having ongoing practice with new skills or discussing new perspectives, which you then can review with your therapist in your regular appointments. From this perspective, you can see that I tend to favor a therapeutic perspective that helps you to feel empowered, both in new skills you acquire and in new ways of considering how you will handle the stress and the decisions imposed by your infertility experience. This is not the only therapeutic perspective, and it may not be the most productive one for every client. So the important thing for you and your partner is to assess how you feel about your therapist's way of viewing her relationship with you, her willingness to accept your input and your questions, and her willingness to challenge you to think in new ways about painful issues. Therapy is not a full-time "feel good" experience, but it should be a relationship in which you feel both trust and confidence that your counselor has her finger on your emotional pulse and is keeping pace with your readiness to move forward. With your infertility physician, there should be times when you pause to assess where you are and what's next. The same is true in therapy. I use every 6-8 weeks as my "pausing point" with clients, partly to check out how they are feeling about the changes we are working on, partly to give them my feedback on their new skills and the work that lies ahead, and certainly to see whether they are satisfied with the direction and the pace at which I'm encouraging them to move. I always welcome critical feedback or discussion of therapeutic frustrations at any point during therapy, but I also am a big believer that a regular pausing point helps my clients and me to be attentive to both progress and pace. Let me spend some time now on ending the counseling relationship. Ideally this decision is a mutual one, perhaps growing out of a conversaton at one of your pausing points. In the best of circumstances it will be an outgrowth of achieving the goals you set in the course of therapy or, even more hopefully, your success in becoming pregnant (although I confess that most of my client couples have found pregnancy to have its own stresses, so many of my clients continue on a reduced schedule until they have celebrated a healthy birth). In less favorable circumstances you may find that you are dissatisfied with your therapist, efforts to address those dissatisfactions have not yielded changes, and you decide to end the relationship. Then the question becomes whether you believe that it would be constructive to identify a new therapist, in which case you hopefully will have a more successful experience. But if you are ending therapy on a successful note, feel free to raise with your therapist that, if new concerns arise, or if you find yourself needing a "booster" session, you hope that you and she could reconnect to assess next steps. So, in the spirit of "getting the most out of therapy," I hope my perspective is helpful in your anticipating how you might begin your therapeutic relationship, as well as how to provide input as the relationship progresses. Infertility is not a smooth road to travel, but the support and skills of a good therapist can help you feel empowered as you face emotional challenges.